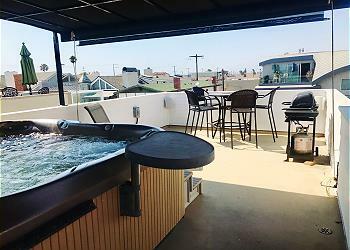 Remodeled 2 Bedroom Steps to the Beach Rooftop Deck with Hot Tub and BBQ! Remodeled to focus on guest comfort. The main floor features an open floor plan kitchen, dining room, and living room, as well as guest bedroom and bathroom. Upstairs is the large master suite and huge rooftop deck with hot tub, BBQ, and seating.